I am now officially way behind on completing things on my 101 list. My excuses include moving last fall, being in school last fall, the winter (it’s just not as fun to do things), and having a new job. These of course are not legit excuses – I could have easily continued to chip away at the list. But oh well. Maybe I can get back on track a little and at least finish with a strong push! I did finally break into #39, to read 5 classic novels I have never read. Although we read a lot of classics in high school, there are a lot more that we didn’t that I would like to read. I love reading but I definitely don’t make enough time to – too much time spent on the computer and watching tv. I’m glad I read it and will definitely have the kids in my life someday read it. I need 4 more classics – suggestions are welcome and wanted! 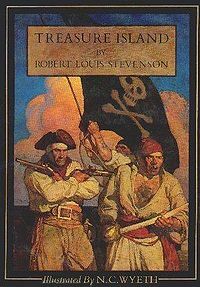 Categories: Thoughtful Thursday | Tags: 101 in 1001, books, reading, Treasure Island | Permalink.